The building that was once a public house, The King's Arms, is located on the corner of Pembroke and George Streets, at postcode PL1 4JS. According to English Heritage it was built in the late 19th century. However, I have a suspicion that dating is wrong, for two reasons; one is that a queen was on the throne at that time, yet the pub is called The King's Arms; the other, stronger reason, is that it is listed in Pigot's Directory of 1830. The directory identifies the public house by its name, gives the correct address and number in Pembroke Street, and names the landlord that year as Francis Dorrington. In 1830 a king was on the throne, hence the pub's name making more sense. Therefore, this ex public house may have been built early 19th century, not late, as is documented (but see a second interpretation below, under the 20th century). It is a striking looking building, with numerous features, those immediately observed are its colour, the arched windows, and the turret. 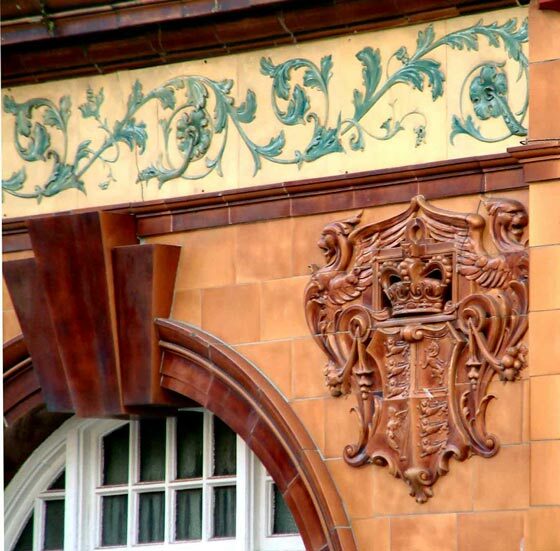 On close inspection you will see the lovely glazed tiles, a deep, moulded coloured frieze running the full length of the building, and what appears to be a royal herald repeated between each window. The next photo captures several of these details in one image. 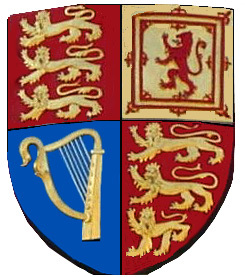 The pub sign, last seen displayed in 2004, was identical to the shield section of the UK royal coat of arms - it contained three passant guardant lions of England in the first and fourth quarters; the rampant lion of Scotland in the second, and a harp for Northern Ireland in the third quarter. Below is an image of the actual shield on the uk coat of arms - which is virtually the same as the pub sign used to be. The text across the top of the sign reads, The King's Arms. The sign is just visible, on the left of the first image above, which I took in 2004. The shield section of the eight heraldic-like panels, in between the windows, is the same as the pub sign was, thus, the shield part of the panel is definitely royal. Whether the full panel is royal is best decided by others who know such things. The best I can do here is to say it's as near as... The crown on top of the crest is correct, that too forms part of the official UK arms. The only difference I can see is the supporting creatures, to the left and right. In this case it appears to be some form of dragon with wings, whereas on the official arms the supporting creatures are a lion and a unicorn. When the 20th century arrived the pub was being run by John Martin and later his son James Martin. According to Winston Guy, they ran it between 1873 and 1913. 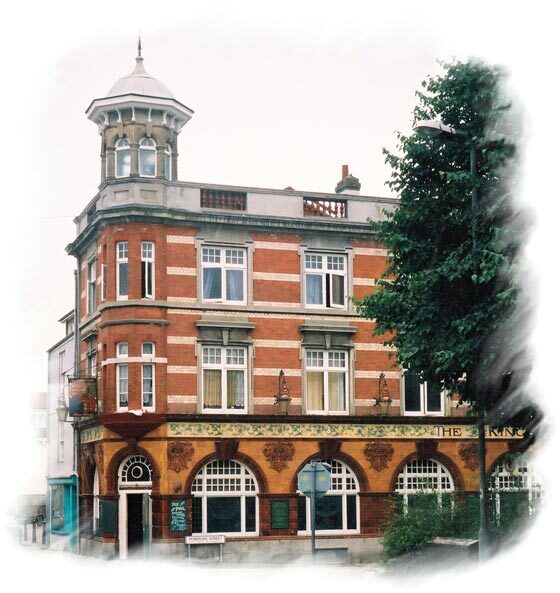 While John Martin was running the pub, the owner of the building, in 1902, was John Nodder. Nodder applied for planning permission to rebuild it, which was approved on 1st September 1902. The architect for this work was Edgar M Leest (who, the year before, was the Mayor of Devonport). Plymouth & West Devon Record Office holds the plans for the rebuild (Ref: PCC/60/1/859), including foundation plan, ground floor plan, first floor plan, second floor plan and roof plan. The extent to which the rebuild was carried out, if at all, is unknown by this author, the plans have not been examined. If the rework to the building was carried out, the date of 1902 may hold some significance - it was the year King Edward VII was crowned. With regard to the validity of the pub's beautiful heraldic panels, they could well have been made in celebration of the coronation, and later sanctioned by the king. This would fit with the rebuild, and the need for the public house to present its new face. 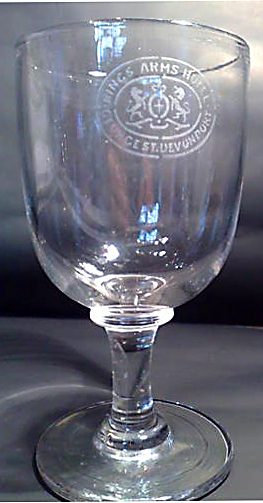 A glass from earlier times, probably early 2oth century, when the building was a public house. The text on the glass is ... Kings Arms Hotel, George St, Devonport. The King's Arms became a Grade II listed building, through English Heritage, on 9th November 1998. By 2005 Plymouth City Council had included the property in its Buildings at Risk Register (BAR); both the pub, number 60 and the adjoining property, number 61, were placed on the BAR at the same time. The King's Arms ceased functioning as a public house in early 2005. During 2005 the pub suffered a couple of fires, with firefighters being called out both times, on one occasion in November the ground floor was significantly damaged; on another occasion a chimney was said to be 'well alight', and an aerial ladder platform had to be used by the firefighters. Late in 2005 planning permission (Ref 05/01828/LBC) was sought to convert the ground floor into a self-contained flat, however, the application was withdrawn (Ref 05/01826/FUL) in December 2005. 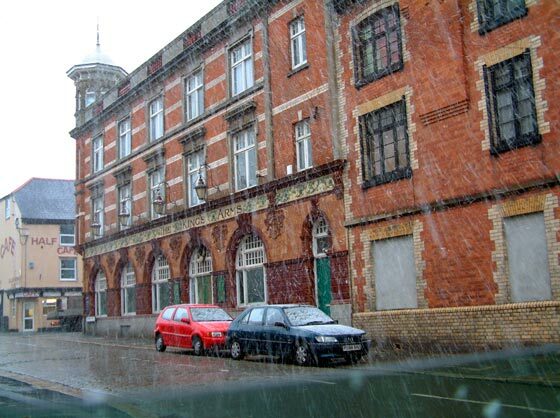 The King's Arms - photographed from Pembroke Street while it was snowing. - Winston Guy. Three Towns Bottles, 2005. Available on CD.